Konnichiwa, mina-san! (Hello, everyone!) Last time I wrote about how to talk about your favourite athlete/sports teams. In this column, I’m going to teach you some phrases that you can use when watching sports. When you’re watching sports, you can really ramp up the excitement by raising your voice and shouting your support for the athletes. 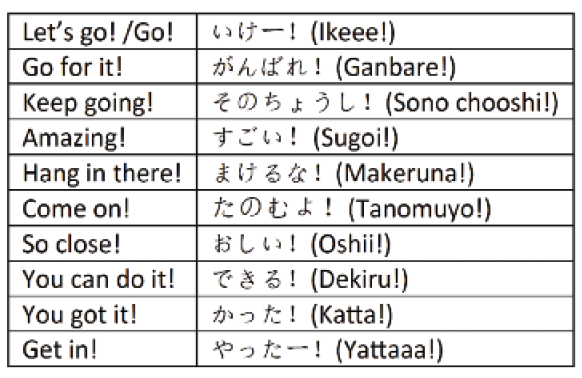 Of course, there are lots of excited cries of support that need no translation throughout the world, like shouting “yaaaay!” But let’s teach you a few ways of shouting support that are used in Japan. Picture this: You are watching sports in a Japanese sports bar or café, or you are watching a Japanese team or athlete, and you’re going to act like a Japanese person and yell your support! It is difficult to directly translate these short phrases and you often won’t see them in textbooks or learn about them in classes, so if you get the chance, try to listen out for these phrases that a native speaker of Japanese might use. These “words of support” are also used when people are cheering on colleagues or encouraging children, so they are really useful to remember! By the way, do you know about “undookai” – which refers to the well-known sports days that take place in Japanese schools? These “undokai” are big events in the school calendar that school children really enjoy. Families will also bring lunchboxes and turn up to support their children. “Undookais” always start with traditional “radio taisoo” (radio warm-up exercises) and then there are many fun activities: “tamaire” (two teams throw red or white balls into a basket on top of a high pole), “oodama korogashi” (a giant ballrolling contest), “tsunahiki” (tug-of-war), “ninin sankyaku” (three-legged race), “pankui kyoosoo” (bread-snatching race”) and more. Children throw themselves into these activities with all their strength! At “undookai”, you can hear lots of the “words of support” that I taught you in this month’s column. There’s only one more month left of this year. In the February 2018 column, we taught you how to say New Year’s greetings… so next month I’ll teach you how to say year’s end greetings! I hope you are all looking forward to it.